Fixed a minor issue on Miles (PUC) report. NEW: A new Update CC (Credit Card) Exp Date button is added to trip payment window (Bottom Right). This feature allows you to update a credit card expiration date for a selected payment entry which has already been recorded, and especially if you need to issue a Refund for a credit card that has expired. Fixed: Driver SMS was including CAR # twice. NEW: Export email addresses from the dispatch window. You can find this option under the Email menu button at bottom right of dispatch window. The exported email addresses are retrieved based on the Email Confirm To drop down list or the Alternate Email Address field. You select to export the email addresses as: one email address per line or email addresses separated by commas. Sending email to vehicles now uses the same format as sending SMS messages to drivers. Added EProcessing credit card gateway option. Fee applies. Various internal fixes and improvements. Improved the dispatch window resizing so it fits properly on various display resolutions. The dispatch window will now always display in split mode when first opened: trips on top part and routing on bottom part of the window. Account list window will resize display if window is made larger. Drivers Que List now displays the driver's first and last name, along with the driver number. Fixed: Luggage entry field tabbing sequence on the trip window. Added driver labels report for the UK market. Tab key sequence in trip window fixed. Improved CSV files import (Comma Separated Value) into LimoWiz. This is will save for new users of LimoWiz to import their existing clients. New: CSV files import for passengers. Add option to force data files update and repair from inside LimoWiz. Implemented a fix when saving trips. Added "Fix File Path" button on Terms and Condition tab and HTML Terms tab in the LimoWiz settings. This is needed if LimoWiz Network version is moved from an old server to a new server and the path information is not the same as the old server. This will ensure that files are found and loaded correctly when emailing or printing reports. Corrected the Tab key and Enter key movement on trip window to go to proper data entry fields. Removed Red color for discount text on html invoices. Confirmation email messages can now be sent to two or more recipients from the dispatch window or trip window by separating an email address by a semi colon. For example: under the account profile, enter two email addresses in the email address field and separate them by a ; (semi-colon). Sample: emailaddress1@example.com;emailaddress@example.com. Please note that this feature is only available for email messages sent from the dispatch window or trip window. Official PCI Compliant version of LimoWiz released. All users MUST download this version. All users must download this version to ensure compliance with credit card security standards. On certain versions of Windows, important data files attributes were changed to hidden by the operating system thus causing various issues to program updates and backup. Now LimoWiz checks and updates the attribute to "Normal". Account Sales Report (under Reports menu, Account Reports) has a new check box to hide accounts with zero trip count. Tax/HST/VAT ID: now prints on multi-trip and single trip invoices if entered on Billing tab under LimoWiz Settings. The Tax Field Name must be set under the second Trip Settings tab under the LimoWiz Settings. Fixed: Pay Method was not being saved when making multi-trip payments in A/R window such as Company Check, Cash, etc. Credit Card Transactions were not affected. Improved the speed of dispatch graph by vehicle. Fixed multi-trip credit card payment Email. Fixed multi-trip PAID statement/invoice report printing of Total Charges. Improved Trip Window design and layout. NEW: You can change the Font style and size of the dispatch window. See Dispatch tab under the Settings. You need to manually adjust columns width if font is changed to larger size. Fixed: Inactive driver were included in available drivers list in the Drivers Que list on the Dispatch window. Various internal fixes and improvements to ensure data integrity and reduced size. 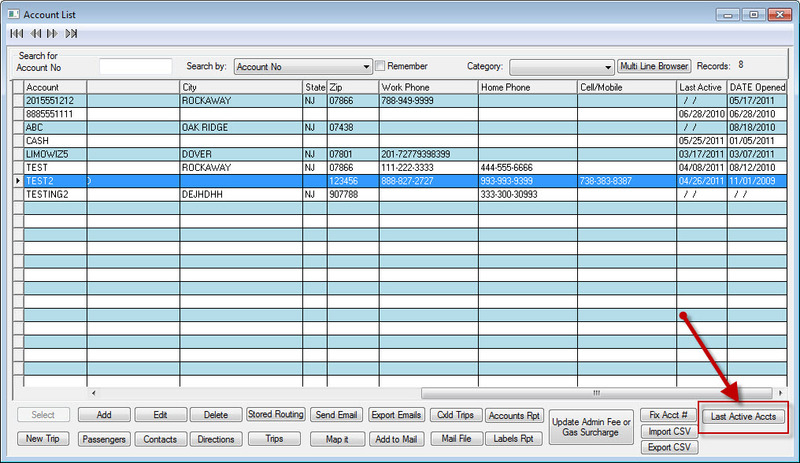 Improved Dispatch Window with instantaneous display of trips. Added warning when multiple trips are tagged and you want to change the trip status. NEW: You can change the Trip Type (Category) foreground and background colors when displayed on the Dispatch window. See Browse menu, Trip Types List. NEW: Login window now displays news feed from LimoWiz.com to keep you up-to-date. Service Type selection stopped working on Dispatch window in version 10.5.8. NEW: Print routing line on confirmation only button. See Routing window. 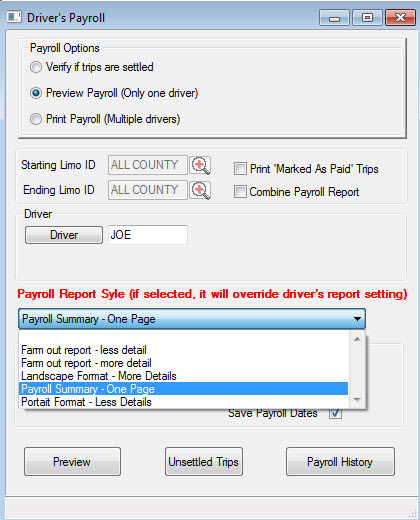 NEW: Payroll Summary Report with driver information and Total Pay only; no trip details. So, only one page prints per driver. 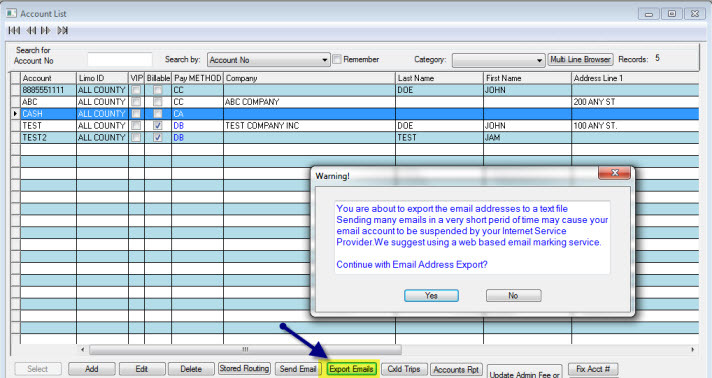 NEW: Export Email Addresses for account list, passengers, account contacts and drivers. This feature allows you to export the email addresses to a text file with the option for email addresses separator to be a semicolon or to have one email address per line in the exported file. 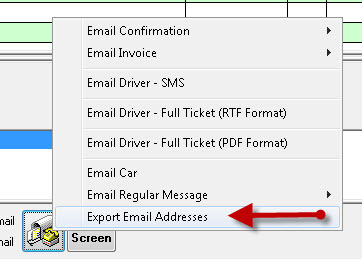 See Export Emails button on the account list for example. We suggest using a web based email marketing service if you are sending a large number of email messages to your clients to avoid being blocked by your internet service provider. Added credit card expiration date check before credit card is sent for processing. Fixed an error introduced in 10.5.6 while paying multiple tagged trips.